This tutorial explains how to use keyboard input to move an object around. But rather than telling the object how far it needs to move (like in this other tutorial), we will apply force to the object instead. This means that the object your moving can also hit other objects and interact with them rather than just going through them. To begin with, you need to create an object or use a model that you want to move. Then you need to add a Rigid Body component and a Collision component so that this object can collide and interact with other objects in the scene. For this example, I have added a Box entity (click + in the Hierarchy and then click Box) but you can use another 3D shape or model. 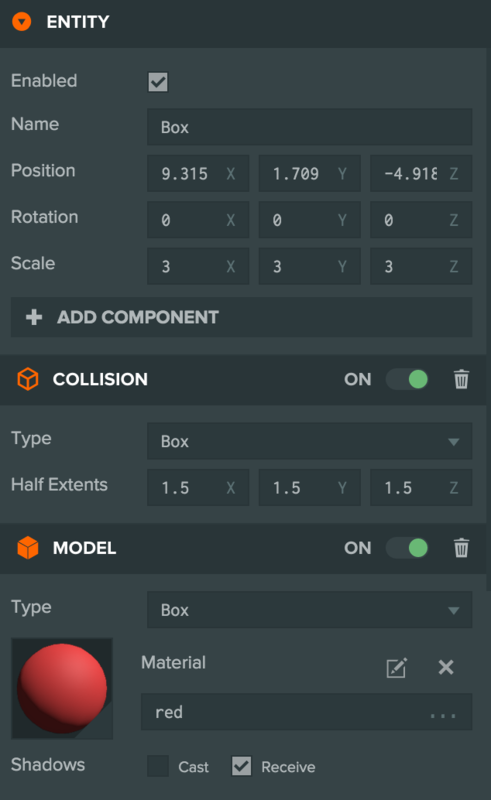 Then you need to select the object and click on Add Component (in the Inspector panel on the left side of the screen) and choose the Collision component. If you have a box shape (entity) then you should set the Collision Type to Box (if you have a sphere shape, then select Sphere for Type, and so on). Match your collision settings up so they look like the settings shown below. The numbers in the Half Extents property boxes should be half the numbers in the Scale property boxes above it. Eg. if the scale X property of the box has a value of 4 then the Half Extents X value should be 2. Now click on Add Component again and this time add the Rigid Body component. Change the Type to Dynamic and modify the values so they are the same as those below (experiment with these values later to get the effect you want). 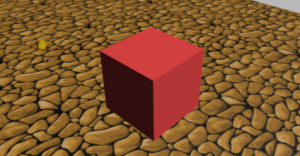 It is important to make sure any other objects that this object will interact with also have Rigid Body and Collision components attached to them. For example, if you don’t want this object to fall through your ground in the scene, then the ground object should have a Static type Rigid Body and a Collision component. If you want other objects to not be moved by this object, they should have a Static type Rigid Body and Collision component. Otherwise, if you want this object to move other objects when it touches them, add Dynamic type Rigid Body and Collision components to those other objects. 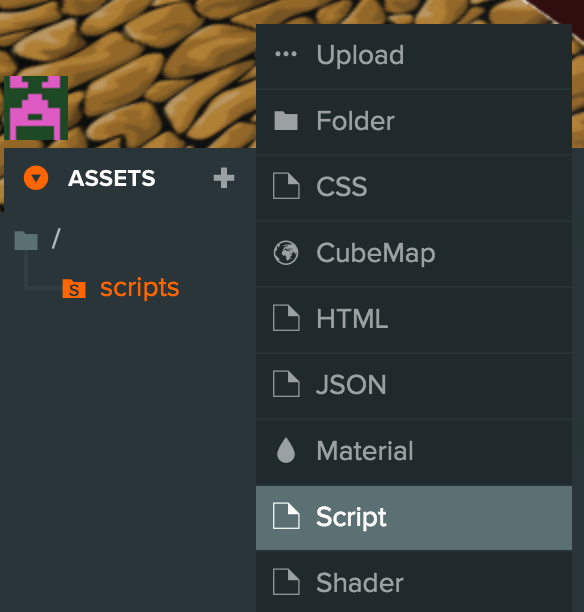 Click on + in the Assets panel and choose Script to create a new script. Call the new script moveWithForce.js and hit Enter to create the script. Now you need to attach the script to the 3D object or model you want to move or control. Select the 3D object (eg. box) and then click on Add Component and select Script. Drag the moveWithForce.js script onto the Scripts component on the object in the Inspector panel and then let go. The script should now be attached to the object. // When the space bar is pressed this scrolls the window. // Calling preventDefault() on the original browser event stops this. Now click on Save and then go back to the game Editor window. That’s it! Launch your game by clicking on the Launch (play) button and you should now be able to control the 3D object/model by using the keyboard to move it around and make it jump. The code is set up to move the object using the arrow keys and space bar to jump. However, you can change these keys and you can also remove the code that makes the object jump if you don’t want to make it jump in the game. This video tutorial explains how to add particle systems to your PlayCanvas game. A particle system allows you to add a range of animated effects such as smoke, fog, bubbles, flames, and sparks. Tip: You can also use an image for your particles by dragging an image that you have uploaded to PlayCanvas (eg. JPG or PNG image) onto the Color Map property on the particle system in the Inspector panel. Here is the sample code for this tutorial. Make sure you create a new script asset called move.js and then add it as a component to your 3D object (eg. a box). Then add the code to the move.js script. Launch your game and then watch the object start moving to the right (if your object moves to the left, then your camera is on the opposite side of the object). Try changing the x, y, and z translateLocal parameters to make your object move in different directions at different speeds. In this tutorial you will be introduced to Skyboxes and CubeMaps in PlayCanvas. A skybox is a method of creating backgrounds to make the environment in a 3D game look bigger than it really is. Sky, distant mountains, hills or buildings are projected onto the six interior faces of the cube using a technique called cube mapping which creates an illusion of distant 3D surroundings. A CubeMap in PlayCanvas is stored as six square images of textures. 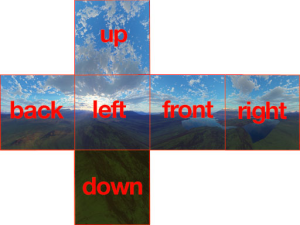 You can download images to use as a CubeMap for your game’s skybox (some links are included below). Below is an example of a cube map. An example of cube mapping. Image by Arieee (redistributed using the CC BY-SA 3.0 license). Watch the video below and then scroll down to find some links to downloadable cube maps for your own project. Yokohama cube map (used in the video tutorial – this cube map was used according to the CC BY 3.0 license). Watch the video below to see how you can use lighting in your own PlayCanvas game. In this tutorial you will learn about the PlayCanvas features and tools and how to create, move, rotate, and resize 3D shapes. Watch the video below to get started with PlayCanvas. This video tutorial explains how to use particle systems in your Unity game and also an introduction on how to use C# scripts to control a particle system. Watch the video below and then scroll down to see the sample code. The sample C# code below shows how to play or stop a particle system when a key is pressed. This code should be placed inside the Update() method. In this tutorial you will learn how to animate 3D objects you have created in unity by changing their position, scale and rotation on a timeline. In this tutorial you will learn how add sound to a scene in your game. You can add sounds that play constantly in a scene such as background music and you can also add sounds that only occur every now and then or that occur after an event. Sounds can also be looped or just play once. There is also 2D sound (heard everywhere in your scene) and 3D sound (heard only when you are in a specified proximity to an object/sound). Sound can be scripted but you can also add sound without any code at all. Watch the video below or scroll down to read the step-by-step instructions and sample code. Make sure there is one (and only one) Audio Listener component in your scene. It should be attached to the character controller’s camera or main camera. Delete or disable any other audio listeners as there can only be one in any scene. Add an object (eg. empty object, cube, sphere) or use an existing object in your scene to add the sound to. Select the object and click ‘Add component’ in the Inspector panel. Add the ‘Audio source’ component to the object. Find an audio file (eg. MP3, OGG file) and add it to the ‘audio clip’ property on the audio source component in the inspector panel. To make the sound play throughout the whole scene, enable ‘Play on awake’. You can also check the ‘Loop’ option to make the sound repeat/loop. Play the scene to test your audio. To use the audio file as 3D audio, drag the ‘Spatial Blend’ slider from 2D to 3D – this means that you will only hear the sound when you are near the object. You can change some of the properties to specify how it fades away and how close to the object the player needs to be to hear the sound. Also, you can check if audio is currently playing by using .isPlaying(). Any looping sound or a song can be turned on and off using an if statement that checks if the audio is currently playing – just add something like this to your Update() method. How to change the audio clip using code? Lastly, you will need to go into Unity and drag the audio clip file (eg. MP3, OGG file) onto the ‘otherClip’ property on the script component (for this script) in the Inspector panel. A Graphical User Interface (GUI) provides a way for the game to provide information to the user or to read information from the user. This can be in the form of labels, buttons, text boxes, sliders, menus, and so on. The GUI can sit on top of the actual game. It is always a good idea to design your GUI before making the game – draw up a storyboard or wireframe with the types of GUI controls you want in the game and where you want to place them. GUIs are created using code and can be added to any object or script in your game. If you have different parts of the GUI on different objects or scripts, it can become confusing and hard to maintain. It is a good idea to have all the GUI parts in one spot on one object. In order to add a GUI to your scene, you need to add a special method to the script you have created for your GUI which is attached to an object in your scene eg. the camera. The special method that is used to create a GUI is called OnGUI(). This method takes no parameters and returns no data to whatever called it. The method will draw your GUI components on the screen and is called every single frame, just like the Update() method. Different GUI controls (eg. labels, buttons) will have code that goes inside the OnGUI() method. 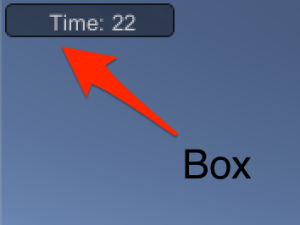 Let’s start making a basic GUI that will draw a label with a short message on the screen. Labels display text on the screen that can be a simple string value, a variable value or a concatenated (joined) string and variable value eg. “Score: ” + scoreVariable. A label displaying the score. Watch the video on Labels below or scroll down to read the instructions and sample code. Create a new scene in your project and a new script called myGUI. Attach this script to the Main Camera. Add the following code to your script inside the class but outside of all other methods (i.e. do not place it inside the Start() or Update() methods). Run the scene and you should see ‘Hello’ displayed on the screen in the top left corner. You have just created a basic GUI with a label that draws in the top left corner of your screen (at position 0 on x axis and position 0 on y axis of screen). The label has a width of 80 and a height of 20. The parameters inside Rect() are x position, y position, width, height. The label can display a string value or variable (or concatenated strings/variables). The box is similar to a label except that a box has a dark border around the label. An example of a box is shown below. An example of a box. Watch the video on Boxes below or scroll down to read the instructions and sample code. Buttons can be in one of two states. A button can be either pressed down or not pressed down. An if statement can be used to determine whether a button is being pressed (a boolean value of true or false). If you keep the button pressed down with the mouse, it will not behave differently to just clicking once. The image below shows an example of a button. An example of a button that reloads/resets the current level in a game. Watch the video on Buttons below or scroll down to read the instructions and sample code. A repeat button is like a normal button except that it can be pressed and held down with the mouse click. It can be used to increase the value of a variable while the button is being held down. A toggle button (also known as a ‘stated’ button because it can be in different states) is like a switch – it can be on or off. It can be used to set something in one state or another. It takes a boolean parameter (whether the button is clicked or not) and returns a boolean value (tells the user if the button is clicked). The two images below show a toggle in two different states (off and on). An example of the code is shown below with a boolean variable called ‘mySwitch’. 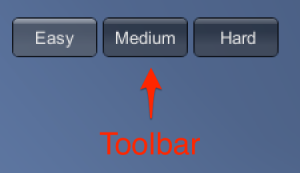 A toolbar is a row of several buttons. You can have however many buttons you like on a toolbar, but only one button can be selected at any one time. An integer variable is used to keep track of which button is selected and an array of strings is used for the different buttons. The number of items in the array determines how many buttons there are. For example, if there are three items in the array then there will be three buttons. If the first button is selected, the integer value will be 0. 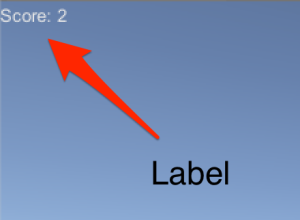 If the second button is selected, the integer value will be 1. If the third button is selected, the integer value will be 2, and so on. The sample code below shows the integer value variable, the array of strings, and the Toolbar GUI control. A textfield allows the user to input text. 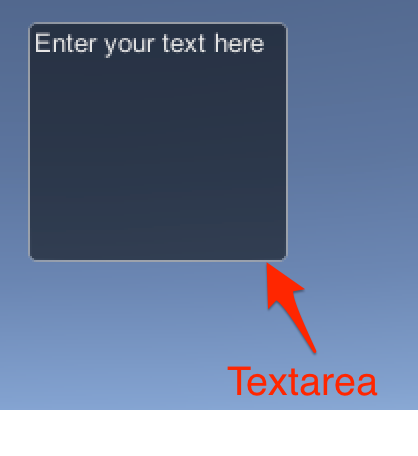 The textfield can display text and also accepts text from the user as they click in the box and type in it. A string variable can be used to store text that is displayed inside the textfield, and then store the text that the user types in. The code below shows how a textfield can be added to a scene. 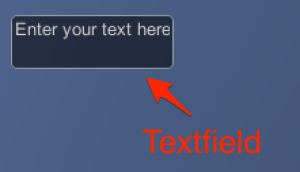 A textarea is just like a textfield except that it can store multiple lines of text. The sample code below shows how to add a textarea control to your scene. Sliders allow the user to select a value between a range of different values by clicking and dragging a slider with the mouse. You can add horizontal and vertical sliders to your scenes in Unity. 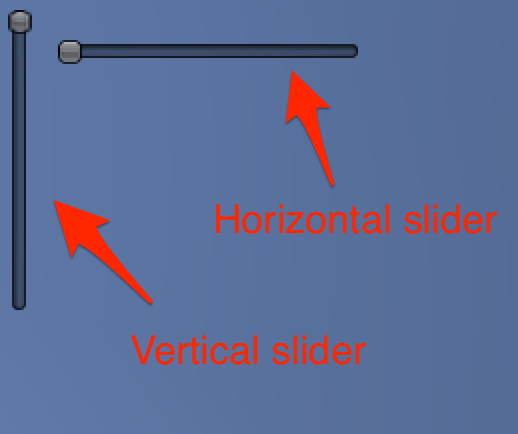 The slider takes a float value that is used for the default position of the slider, and returns a float value that contains the value the user changed the slider to. It also takes a minimum and maximum slider value. The sample code below shows how to add both horizontal and vertical sliders to a scene. In the two examples, there are float variables that are initially set to a value of 0 (inside the main class). Each slider takes a float value and then returns a float value. The x and y positions as well as the width and heigh are specified. Parameters for minimum and maximum values for the sliders are also added at the end of the statement – in this example, the minimum value is 0 and the maximum value is 100. In the next tutorial we will look at how to customise and style GUI controls. Raycasting involves sending out a ‘ray’ and finding out what it hits. Raycasting is used by game developers to find the distance between players and another object, aiming, detecting nearby objects, and finding line of sight. The code below is one example of using the Raycast method. There are a few parameters that this method takes. The first is the Vector3 origin or position of where the ray starts and can hold three floats (the x, y and z coordinates). The second, Vector3 direction, is the direction that the ray will travel. The third, float distance, is the distance that the ray will travel before it stops. The last parameter is mask, which specifies what layers will be hit by the ray. The distance and mask parameters are optional. If they are left out, the ray will travel forever and hit all objects. The code below could be attached to a camera in your game and used to detect whether an object is in front of the camera. Where you see ‘out’, it means that whatever object was hit by the raycast will be stored in the ‘hit’ variable when the method finishes running. So let’s give Raycasting a go! Step 1 – Create a new scene in your project and add a few 3D shapes around the main camera in your scene. The shapes should be close enough to the camera so you can see them clearly when you run the game. Step 2 – Add at least three or four shapes that are spaced out nicely. Step 4 – Add the following code to your class (outside of all other methods i.e. not inside the Start or Update methods). Step 5 – Now run the scene. You will notice that the mouse will now move the camera around. When you center the camera on each object in your scene, those objects will be destroyed and a message will be displayed in the console. You could extend this game by adding a score or time variable and displaying the score on the screen (something covered in the next tutorial – Graphical User Interfaces!). So what is collision? Collision is knowing when one object has come into contact with another object. In this tutorial, we will look at collision detection, the Rigidbody component, colliders, triggers and physic materials. Scroll down to watch the video on all of these things or read on. 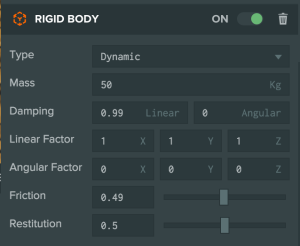 For objects to use Unity’s built-in physics engine, they need to include the Rigidbody component. 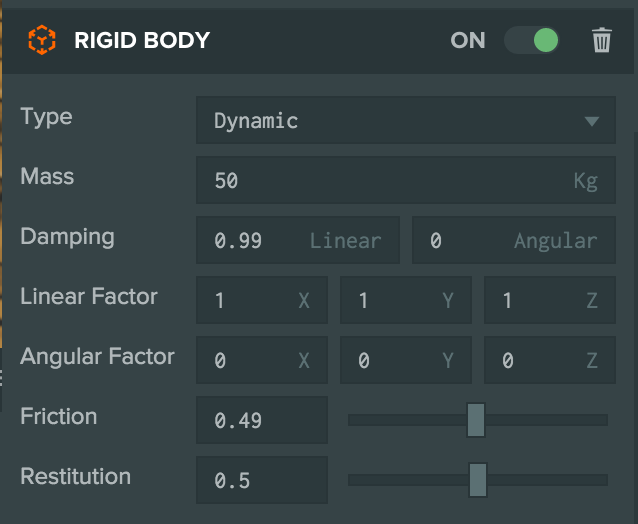 To add it to a selected object, click Component > Physics > Rigidbody from the Inspector panel. In order for objects to detect collision, they both need to use a component called a collider. A collider is a perimeter around an object that can detect when another object enters it. Note: Objects don’t need rigidbodies to collide – all they need is a collider object. But rigidbodies allow objects to fall and are also needed for trigger collision – we’ll talk about that later. Objects like cubes, spheres and capsules already have collider components when they’re created. 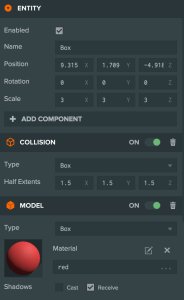 You can add a collider to an object by selecting the object and clicking Components > Physics from the Inspector panel, then select the collider shape you want such as box, sphere, capsule, wheel, terrain, or mesh (which takes the exact shape of a 3D model but can greatly reduce game performance). You can try out different colliders with different shapes. For example, you can add a sphere collider to a cube so that it will roll around like a ball, and you can change the size of a collider so that the object either floats above other surfaces or sinks into other surfaces. Watch the video below to see how you can work with the Rigidbody component, colliders, triggers and physic materials. Then scroll down to see more information on physic materials, triggers and the sample code. To create a physic material, click Assets > Create > Physic material. You can then modify properties to make the object behave like metal, wood, rubber etc. For example, you can increase bounciness to make it behave like rubber. Once you have created a physic material you can add it to a collider attached to an object from the Inspector panel. Watch the video above to see how. OnTriggerExit – this is called when another object exits the trigger. Triggers can be used to program what will happen if a player falls off a map, a player enters water, or an enemy enters a perimeter, for example. In this code, ‘other’ is referring to “another object”. Remember, you can replace the OnTriggerEnter method with OnTriggerStay and OnTriggerExit too. All of these things are covered in the video. Why do objects fall through my terrain? If you add have created objects with colliders that fall through your terrain that has a collider, you might want to disable the collider on your terrain and then use another collider attached to an empty GameObject. Click on GameObject > Create Empty an then attach a collider to that empty object. You can enable ‘Is Trigger’ on that object and then move the object and resize its collider so that it is positioned under your terrain. This tutorial explains how you can write a script in C# that can access other objects and then modify their components. In this example, we will attach a script to the Main Camera and then use that script to access a Cube object and modify it’s position, rotation and scale. Here is the sample code that is attached to the Main Camera and accessing the Cube object. This tutorial will show you how to create a simple rolling ball game using the Rigidbody physics component in unity to add force and gravity. In this game, we will use the W,A,S,D keys to move the ball left and right, and backwards and forwards. We will also use the Space key to make the ball jump up and gravity will bring the ball back down, as seen in the animated GIF below. Watch the video below to see how you can create a simple rolling ball game with force and gravity. Then scroll down to take a look at the sample code. Here is the sample code in C# for this game. This a simple game with no scoring or other objects to interact with, but you could easily extend the game by adding a user interface, scoring, different cameras, and objects to interact with. As an example, you could make a simple pinball game.